The basic white and black tones of these digital models are highlighted by colorful accents and colorful LCDs. As G-LIDE models, these watches are designed and engineered to stand up to the rigors of extreme sports. 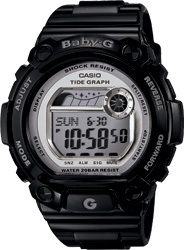 Features include 200-meter water resistance and Tide Graph, for performance geared toward body boarders and surfers. 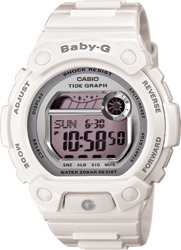 The color LCD of the BG-1006SA gives this model a distinctively trend look.